Bitter or BETTER, You Choose! There are many choices we must make on a daily basis. 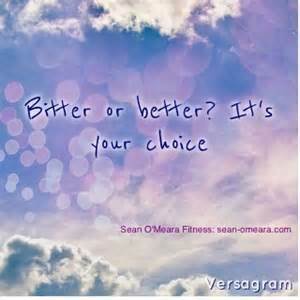 We can choose to be bitter or we can choose to be BETTER. Today I submit to you that we should ALL choose BETTER. When we choose bitter, we bring forth more bitterness into our lives, world and affairs. As I ponder upon what I have gone through I choose to forgive myself and I choose to forgive others, I release past hurts and I choose to be good to me. I release myself from past experiences that I perceived as hurtful. Choosing to stay bitter, choosing to stay hurt may allow me to feel the support of others, the pitty of others for awhile, however, this trend will not put me in the pass to my Highest Good! I will not be able to begin again in this stage. In order for me to have miracles in my life, in order for GOD to Truly direct my steps, I have to choose BETTER, I have to choose me and I can’t choose me if I choose bitter. I have a choice, I can choose to have a grievance or I can choose to be and to have a miracle, bottom line, I can’t choose both. It is not a secret that we all have challenges that we have to face. At times we feel as if we are the ONLY ones going through a challenging experience. Some of us feel that is BEST to keep challenges inside as talking about it might make matters worse or perhaps talking about it will show lack of Faith. All that is fine, but I guarantee you that if you were to hear other peoples’s challenges you will realize that it can always be worse! Today’s challenges will pass. It is evident. Look at your life, think back to 5 or 10 years ago. Remember that challenge? More than likely you do not. Why? It came to pass and more than likely it happened for your Highest. Today’s challenges are here to give you bragging rights. You will surpass your challenge, you will come on top. You will end up BETTER than you were before. If you are Wise, amongst your bragging rights you will acknowledge that of you, you can do nothing and you will give GOD All the credit and the Glory. You know that nothing is here to stay and the ONLY constant we have is change. Be Grateful as you go through your challenges and remember that after your challenge you will have bragging rights.